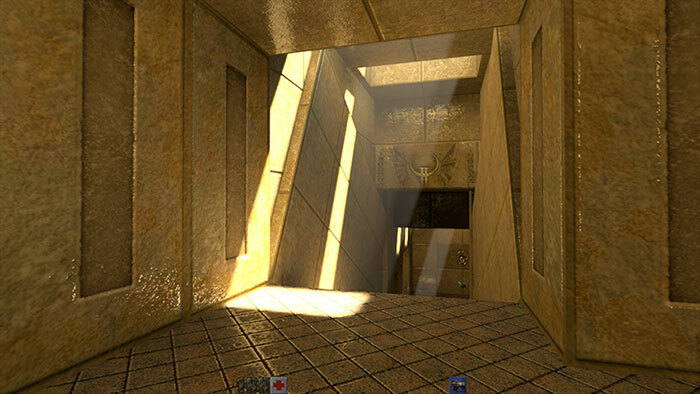 The above demo was based upon the Quake II Pathtraced (Q2VKPT) proof-of-concept mod created by Christoph Schied, a Ph.D. student at the Karlsruhe Institute of Technology in Germany and former Nvidia intern. Sometime in January the project was picked up by a team of about 18 Nvidia developers including Principal DevTech Engineer Alexey Panteleev and Senior DevTech Engineer Manuel Kaemer. They worked to transform the Q2VKPT code into Quake II RTX. Furthermore, the Quake II RTX demo runs with Nvidia VKRay, a Vulkan extension that allows any developer using Vulkan to add ray tracing effects to their games. In a recent interview with Panteleev and Kaemer, AusGamers were pleased to hear that "our goal is to publish an open source version of Quake II RTX." Despite the age of the game (1997 vintage) adding the real-time raytracing tech might make it rather too demanding on non-RTX hardware to run with 'RTX On', for a fast-paced high-resolution playable experience. However, the experience on offer will be rather drastically different, thanks to the huge visual impact of real-time raytracing and related graphicsal revamps in this title. We don't have any named date for when the open source version of Quake II RTX will be released. Quake 2 was one of my favourite games back in the days. From the story mode to the multiplayer matches, I spent countless hours playing it. I even competed in a regional league! Can't wait to see the RTX version out. I too can't wait to use this, I tried the original one that was developed before Nvidia picked it up and whilst it was impressive, Nvidia have really cleaned it up well by the looks of things. My lad and I play Q2 regularly. Co Op and Deathmatch. IT runs on anything, and he's on second hand Dell All in One Core i5 with onbaord Intel graphics, so he won't be getting the RTX lushnes but it will be interesting to see it in the flesh on a 1060. If the RT version is based in any way on the original Q2 source, which is GPL, then NVIDIA has to release the source code. So…20yr old game looks better with modern processes slapped into it? NSS. Wouldn't putting Ray Tracing (if, in fact, that IS his real name) into more recent games - AAA games from say 2018 or 2019 - give more of an indication as to how it improves things?